Product prices and availability are accurate as of 2019-04-24 07:05:48 UTC and are subject to change. Any price and availability information displayed on http://www.amazon.com/ at the time of purchase will apply to the purchase of this product. 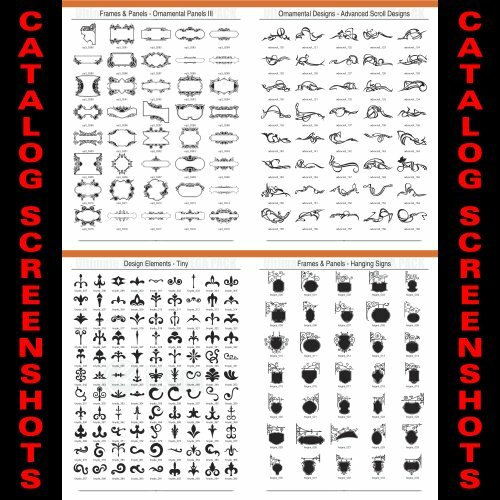 Here's a complete list of all the categories of vector images included in the this massive collection: Design Elements ~ Classic Color (600 images), Classic Black & White (700), Modern Design Elements (100), Wrought Iron (350 images), Tiny Design Elements (600) and Urban Design Elements (40). Ornamental Designs ~ Modern Scroll Designs (290), Advanced Scroll Designs (232), Advanced Scroll Designs 2 (200), 2 Color Scroll Designs (100), Chinese Floral Designs (100), Japanese Floral Designs (100), Mexican Designs (100 images), Celtic Designs (130), Indian Designs (50), Floral Frieze Designs (200), Corner Designs (110), Floral Designs 1 (101), Floral Designs 2 (100), Floral Designs 3 (101), Floral Designs 4 (50), Rectangle Floral Designs (150), Rule Line Designs (350), Enhanced Scroll Designs (50), Classic Scroll Designs (200), Classic Frieze Designs (75), Wrought Iron Designs (460 images) and Renaissance Scroll Designs (50). Frames and Panels ~ Ornamental Panels 1 (1061), Ornamental Panels 2 (1211), Ornamental Panels 3 (1554), Ornamental Panels 4 (200), Ornamental Panels Color (200), Advanced Panels (170), Advanced Panels Color (140), Floral Panels (125 images), Hanging Signs (50), Circle Floral Frames (50), Hand Drawn Ribbons (225), Floral Ribbons (60), Simple Ribbons (30), Torn Parchments (15), Torn Parchments Floral (90) and Sign Panels (210). Additional Designs ~ Exquisite Birds (100), Exquisite Ladies (100), Exquisite Animals (100), Snowflakes (100), Medallions (200), Shields (100), Sign Shapes (100), Flower Baskets (50), Bullets (300), Art Deco Girls (50), Ornamental Dingbats (100), Borders (300), Color Dingbats (101) and Floral Dingbats (20). 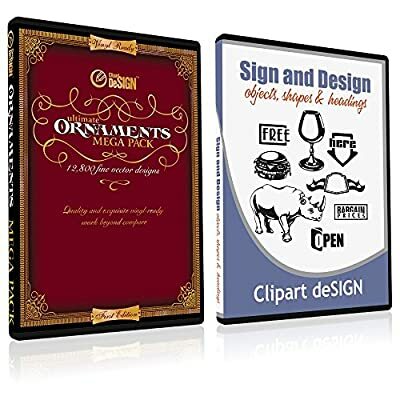 The Sign and Design (complimentary reward) consists of the following categories: Design Objects (398 images), Frames, Ribbons and Medallions (612 images), Sign Headings(200 images), Sign Shapes (40 images) and 442 reward images. The images are available in the following formats: AI (Adobe Illustrator 3.x) and EPS. These are high quality vector images not pixelated/bitmap images like you see on the internet. We do not recommend that you order this product unless you understand what a vector image is and/or know how to work with them. This product is not for amateurs or those who lack basic computer skills. Here's what's included: 12,800 unique high quality "ready to cut" vector images on 2 x CD-ROMs. There's 315 page digital PDF color catalog on disc one of the Ultimate Ornaments MEGA Pack to help you quickly find the images your looking for. There are 58 creative categories. The Sign and Design is a FREE BONUS. It contains 1692 high quality vector "ready to cut" (see photos above) in 4 different categories. It's one of our best sellers and it's a $59 bonus value. This MEGA package is a must have for every sign maker, graphic designer and creative professional. Expect outstanding vector image quality plus clean and exquisite details in every image. 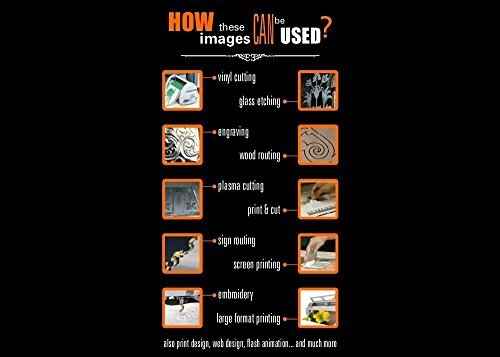 All 12,800 images are optimized for vinyl cutting, CNC, mills, engravers, routers, plasmas, etc. Vector images can be scaled to any size without loss of resolution. Vector images are also easy to edit, manipulate and change to cater to your job or project. The images are compatible with all major design (CorelDraw, Illustrator, Photoshop, etc. ), sign making and engraving programs. Each disc is easy to browse and no installation is required to view the images. Due to their hybrid format the discs are compatible with all operating systems. All images are royalty free and designed for commercial use. This product CANNOT be resold because the royalty free license isn't transferable. Just like all digital goods on CD-ROM, it cannot be returned. Ornamental vector images on stock agency web sites cost $10 - $30 to download one set of vector images. Due to our generious pricing the Ultimate Ornaments MEGA Pack images cost you less you less an a cent! It comes with an enhanced license which includes unlimited reproduction usage including printing, vinyl cutting, CNC, etc. Enhanced licenses on the popular stock agencies cost $100-$210 PER IMAGE. Think about how much you're saving by getting your artwork here!